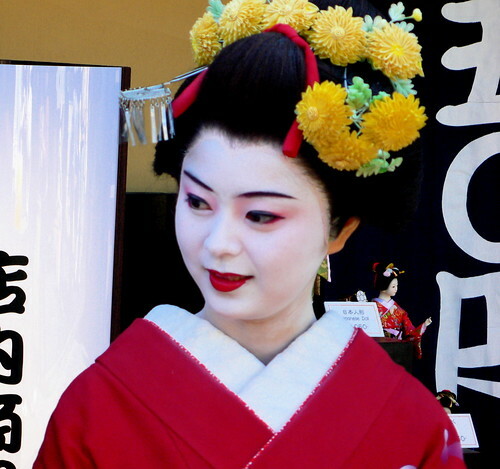 Kyoto is the current center of geisha culture in Japan, though in Kyoto geisha are known as geiko. Geisha, which literally means “art-person,” are artist-entertainers who are trained in a variety of skills including use of the shamisen and shakuhachi, traditional Japanese dance and song, the tea ceremony, ikebana, and classical poetry. 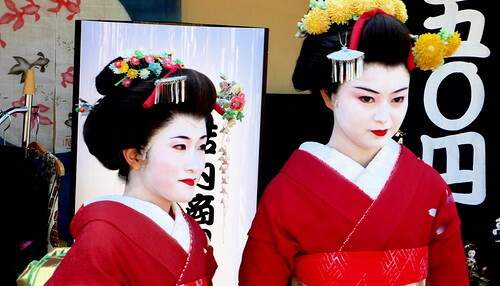 This training usually begins at a young age (though more and more women are beginning their training later in life) when a woman decides to become a maiko, or apprentice geiko. Just like everyone else, Kyoto’s geiko and maiko enjoy walking around Kyoto on a beautiful spring day, and Jess and I saw several small groups strolling through the Higashiyama area throughout the course of the day. The large group of maiko above were busy snapping photo-phone shots of each other, but they very kindly posed for a photo when I asked them if that would be okay. The geiko on the right is named Komomo (“Little Peach” — it’s her geiko name), which I know because I read an article about her in Kateigaho International, a magazine that I have been ridiculed mercilessly by a Japanese friend for reading (“What? Kateigaho? My MOTHER reads that magazine!”). What I like about this picture is the tiny geiko that appears to be sitting on Komomo’s shoulder. What you don’t see in this picture is the circle of amateur photographers surrounding the pair of geiko and snapping away furiously. I stood off in the background and used the zoom. As far as I could tell, the general pattern went something like this: 1) Geiko sighting. 2) Intrepid individual asks if it’s alright to take a photo. 3) Geiko very kindly stop to pose for a picture. 4) A million amateur photographers, seeing that geiko are posing for a photo, form a semi-circle and snap away. 5) After a few minutes, everyone becomes shamefully aware of the spectacle that they are turning the geiko into, and the photographers retreat back into the crowd. 6) Pattern repeats every ten minutes or so. Since this was during Golden Week, on one of the most beautiful days of the year, it was incredibly crowded so this probably isn’t the normal state of affairs. Still, it must be difficult to negotiate a profession in which your everyday appearance always draws so much attention. I think the geiko and maiko that we encountered while we walked through the Higashiyama were incredibly gracious and patient. Probably a central component of learning the craft of the geiko. Very important addendum from the future: I’m pretty sure that none of the women in these photographs are geiko or maiko. 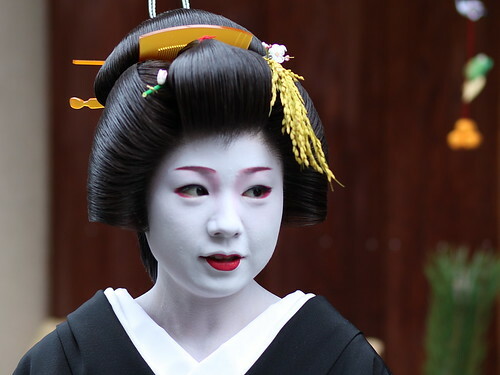 I wrote this post during my first full year of living in Japan and didn’t yet know about the massively popular “dress up like a geiko or maiko for a day” businesses that are all around the Higashiyama area. I still do think the woman on the bottom does resemble Komomo a lot (at least certain photos of Komomo), but I’m pretty sure it’s not her. 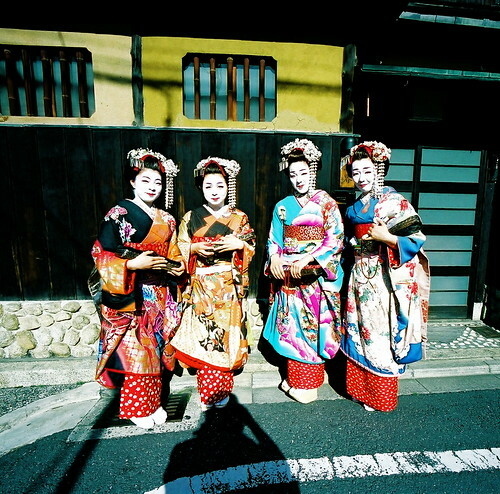 However, the account of geiko/maiko being stopped in the streets still holds. I’ve been walking in the Gion area at night several times when an actual maiko or geiko on her way to work has been seen walking in the street and then mobbed by tourists (non-Japanese tourists) all shoving cameras into her face while shouting “Geisha! Geisha!” to each other. It’s a disheartening way to treat a human being. The city of Kyoto has recently even had to put up signs instructing tourists to respect the personal space of geiko and maiko. I blame it all on that Memoirs of a Geisha movie.